In January of this year the Washington Post’s David Ignatius penning a clear-eyed and strongly optimistic opinion piece about what he called the “ridiculously upbeat story” of America’s unexpectedly strong energy position in the world. Unlike much of the news media’s typical coverage of the oil and gas industry, this former Wall Street Journal reporter, novelist and International Committee for Foreign Journalism lifetime achievement award recipient is able to connect the dots across the full spectrum of the energy landscape. Enbridge Energy has announced it will spend $200 million boost the capacity of its 1,000-mile Alberta Clipper pipeline, providing the Calgary-based firm with the ability to increase shipments of oil across Minnesota by 27 percent to 570,000 barrels per day. The uptick in delivery capacity of oil sands crude will be accomplished by temporarily switching the flow of two parallel pipelines on a 17.5-mile segment across the U.S. border, keeping its operations within existing U.S. State Department permits. The interconnection under construction is just one and a half miles north of the Canada-U.S. border, which will divert the Alberta Clipper oil onto an older, nearby pipeline, known as Line 3. In addition to circumventing lengthy delays caused by an unfinished U.S. State Department environmental review, Enbridge has sidestepped the presidential permitting process that has held up TransCanada’s Keystone XL pipeline. Officials with Enbridge added that the Alberta Clipper could potentially increase capacity to 800,000 barrels per day sometime in 2015 following a second expansion in Minnesota to add more pumps. Also awaiting approval is an expansion of the Trans Mountain pipeline owned and operated by Kinder Morgan which carries Alberta oil sands crude to Canada's Pacific Coast. Canadian regulators recently announced their evaluation of the project has been delayed until 2016. In a dramatic reversal indicative of America’s resurgence as an energy producer, the African nation of Nigeria, once an exporter of oil to the United States, has become dependent on refined petroleum products imported from Texas refineries. According to Department of Energy data (see chart below), exports of U.S. gasoline and kerosene shipped to Nigeria are now roughly equal to what America imports from the West African nation. 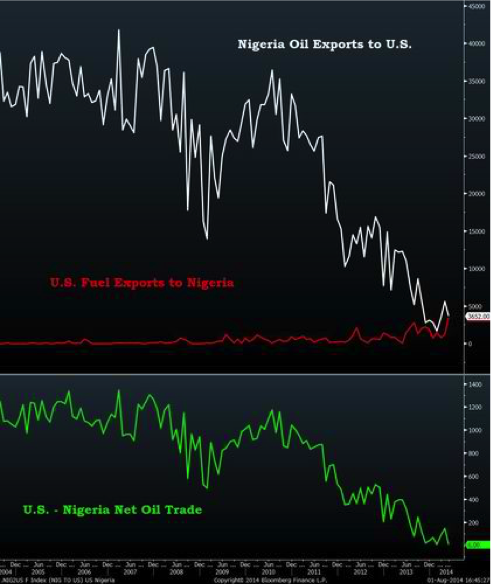 Nigerian crude now accounts for only 2 percent of total U.S. oil imports, down from 7 percent in 2011. The decline of Nigerian oil exports largely neutralizes its importance in setting world oil prices and greatly reduces U.S. concerns about supply disruptions caused by political instability or attacks by militants against oil companies that have occurred routinely in the Niger Delta. Read our SEC filings at https://ir.stockpr.com/qsenergy/all-sec-filings and subscribe to Email Alerts at https://ir.stockpr.com/qsenergy/email-alerts to receive company news and shareholder updates.